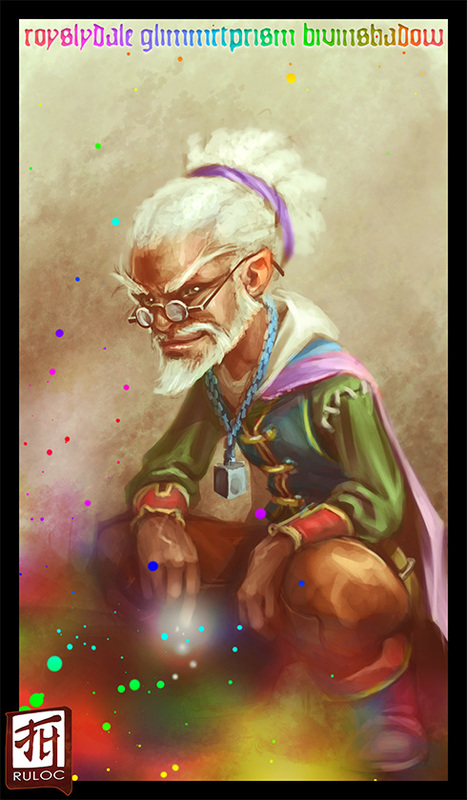 Originally an Abjurer/Master Specialist/Initiate of the Sevenfold Veil, with a multi-colored theme, favoring spells like Color Spray, Glitterdust, and anything connected to the Prismatic series; Reflavoring spells like Blur, Grease, and Web to fit the theme. A bit gullible and naive, but a staunch defender of the innocent and protector of his companions. He has a colorful outfit, red boots, orange pants, yellow belt, green shirt, blue vest or waistcoat, a triangular prism pendant around his neck on a indigo chain, and a purple hairband keeping his white hair in check. He has a neatly trimmed white beard, and small round glasses. His cloak has a rainbow oriented vertically, the colors blending into the all white hood near the shoulders. He wields multicolored light balls with a light crossbow or dagger as a last resorts.